"Let's face it; going to the dentist is not something most people look forward to. But, the staff at Woodland does their best to make the appointment as pleasant and pain free as possible. I am very satisfied with the care and attention. 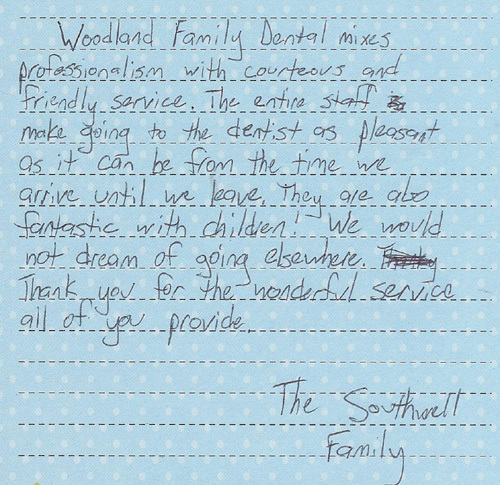 I highly recommend Woodland Family Dental." 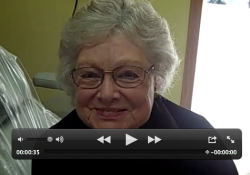 "This was a very pleasant experience. I know it has been a long time since I have had my teeth cleaned due to not finding a dentist that I liked, so Ii know it was rough for the hygienist, but I was not made to feel inferior or ridiculed for not taking proper care of my teeth. She continued to clean and smile the whole time. Thank you for making my visit positive." "The staff is always very warm, friendly, professional, and up to date on the latest dental techniques, methods, and equipment. Why else would I drive 70 miles one way?" "I have just moved to the area and had a need for complicated dental work. I went to a dentist found in the phone book and was very dismayed at the outcome. I heard from a friend about Woodland Family Dental and decided to have the rest of my dental work done there. I was really afraid of going based on my experience with the previous dentist...I can tell you all my fears were put aside when I walked into the office. The staff is very professional, the wait time is non-existent and the level of care and compassion was out of this world. For a change I was the important one in the picture. Everything was explained to me and Dr. Cheryl was present for the whole procedure. I would recommend them for any of your dental needs." 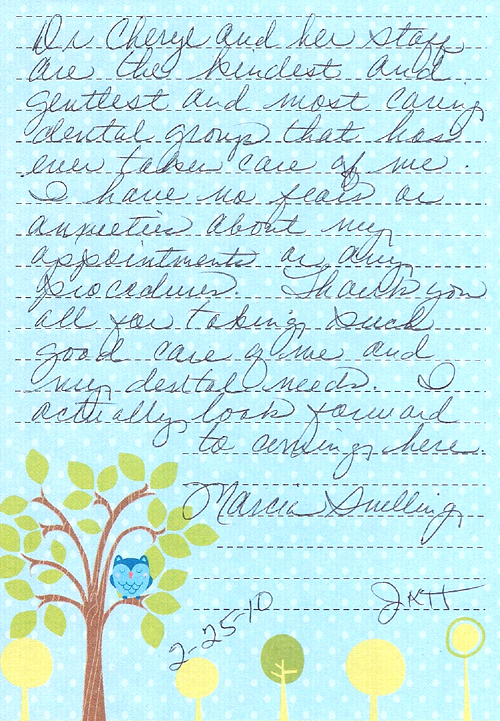 "The entire staff at Woodland Family Dental has been more than I could have imagined or hoped for. From the time I walked into the office until my departure, I was well cared for. They are helpful, supportive, and truly make you feel a part of their family." Click to watch our Video Reviews! 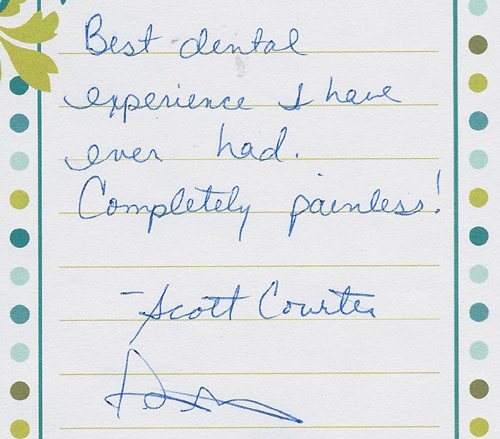 "I have been thoroughly impressed with Dr. Cheryl and her staff. In my many visits, I have nothing but wonderful things to say about the quality of work, customer service, and friendly attitude present at their office. I have never been to a dentist office that cares so much about their patients. Going to the dentist is not a chore like it used to be thanks to Dr. Cheryl!" "Everyone was GREAT! Shelly explained everything in detrail. I have no questions, and she is the best hygienist I have ever been to - YIPEE! Can't think of a thing to make me feel more comfortable. It appears you have a great staff, and they are excellent to their patients. " "I only have great things to report each and every time I have been to your office. I am one of the few people I know who like to get my teeth cleaned. However, being seen at your office makes it even better. It is a very friendly and warm environment. NOTHING like the past experiences my family has had in the past. I also would like to take this time to thank you for taking such great care of my children as well. Many dental offices locally do not prefer to see children, and that can make things very difficult for the working families. Thank you!" 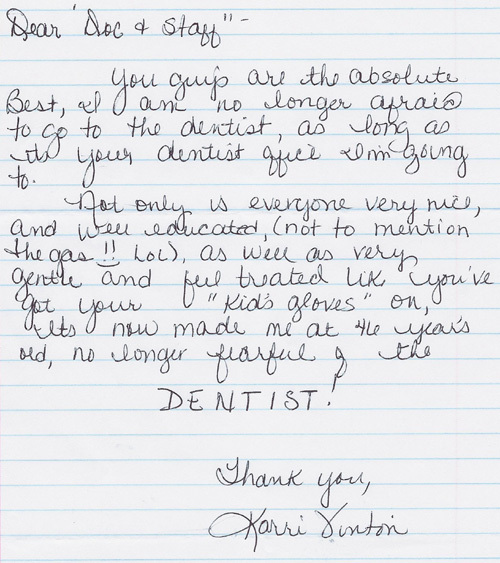 "I would like to say that Janice is the best hygienist I have been to in at least 20 years. I really mean this. She is excellent. Thank you very much. I refer anyone who will listen to your office." "The BEST dentist and staff I've ever been to. Thanks to all of you for just being you." "I appreciate the gentleness and concern shown by all staff, particularly Dr. Mitchell. Thanks." "All of you did a great job! I was very happy with the service that I received. Thank you very much."